Of course, to make that happen, they need a lot of great technical minds. Therein lies the problem, because in Australia, there’s been a 41 percent decline in tech graduates in the past 13 years. And, over the past decade, the country has produced double the amount of tech jobs than tech employees to fill them. “There is a dire technical skills shortage in Australia, so much so that many refer to it as a national emergency,” Atlassian Head of APAC Recruiting Caitriona Staunton said in a presentation at Talent Connect Sydney. Knowing that hiring enough local tech talent to meet their needs would be almost impossible, the company decided to start recruiting internationally. The questions Staunton than faced were big ones: where and how would they recruit? Using a data-driven process, they answered both and made it happen. Specifically, headcount at their Sydney headquarters doubled in the past two years, with a third of that talent coming internationally, mostly from Europe. Here’s an outline of their five-step process, one step at a time. Once Atlassian agreed it needed to start recruiting internationally, the first question was obvious: where, exactly? Using both some internal data and LinkedIn’s Talent Pool Reports, they found that the best place to look for tech talent – specifically, software developers at first – was Spain, Germany, Russia, Ukraine and Israel. Why those five countries? What their data and the Talent Pool Reports showed was that in those countries, the amount of developers exceeded the demand for them. That meant the market for software developers was less competitive there than it was in other hotspots like Silicon Valley and London. So, those countries were a good place for them to recruit. Next, it was time to start advertising their jobs and their country in those countries. But, before they built any marketing materials, they did some research into what developers in those five countries were looking for. Again, LinkedIn’s Talent Pool Reports were their friends, as survey data within them showed their targets were looking for a job that had a positive impact on people’s lives and for a company with strong values that offered a good work-life balance. Atlassian also knew that their location – Sydney, Australia – was appealing to the people they were trying to recruit. They used that information to build their recruiting collateral, which they then got out to the right candidates in their target countries via LinkedIn Sponsored Updates. This video, which they both promoted on LinkedIn and embedded on their career site, really emphasizes the values at Atlassian. The larger point is to show that it’s both a great place to work and the work Atlassian does can legitimately help people’s lives. 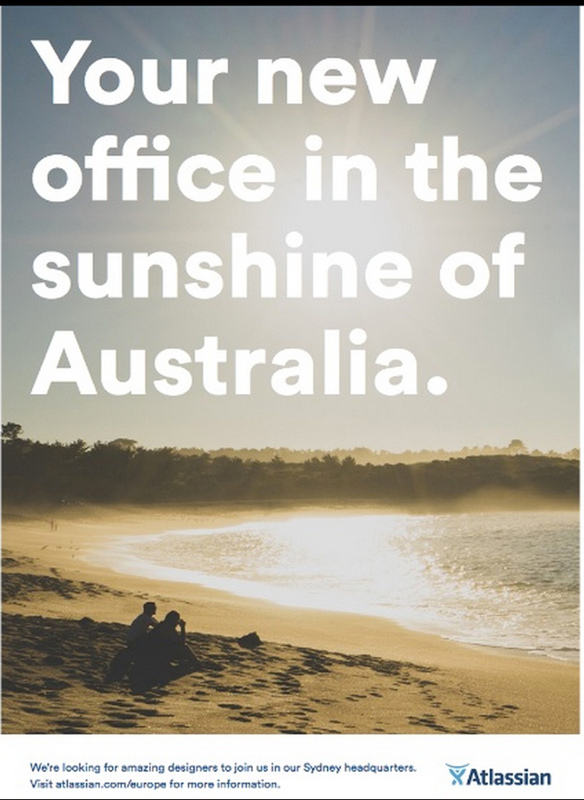 This ad– which Atlassian promoted via Sponsored Update on LinkedIn in the middle of the European winter – was to show off their great location in Australia. To further hammer home that point, in their recruiting collateral they even began referring to Sydney as “Silicon Beach,” obviously playing off Silicon Valley and Silicon Roundabout. The next step, beyond just the company spreading the word, was Atlassian’s employees joining in as well. To do that, Atlassian began turning their employees into brand ambassadors. In the example of recruiting more UX designers, Staunton and her team used data to get Atlassian’s existing UX designers to buy in and help her recruit. Specifically, she showed the team that they, through LinkedIn, were connected to 60 percent of the world’s UX designers. Therefore, Staunton explained that just Atlassian’s existing UX designers optimizing their LinkedIn profiles and posting about what they liked about working at the company would have a massive ripple effect in that community. The employees agreed and signed up for social media trainings, optimized their profiles and began posting about their work. That had a major impact on Atlassian’s ability to recruit, as after the trainings the company saw a 35 percent increase in the number of UX designers following Atlassian on social media and a 15 percent increase in the number of UX designers viewing Atlassian’s LinkedIn career page. All that was great, but Atlassian needed something really dramatic to create a buzz for their company. 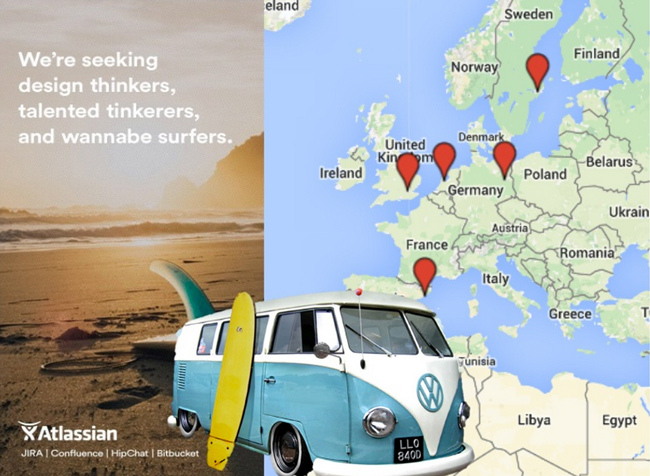 So the company bought a VW bus, plastered the Atlassian mascot on it and drove around Europe seeking “wanna-be UX surfers”, i.e. recruiting UX design talent who would enjoy Australia’s beaches. The stated goal of the road trip was to hire five UX designers in five days, which Atlassian accomplished. But the bus also generated a ton of free PR and created a general buzz in Europe about the Australian company. “It was about cutting through the clutter and building our brand there,” Staunton said. Once Atlassian got a strong candidate, the last thing they wanted to do was lose them. But that was a challenge, considering the new hires had to pack their bags, leave their homes and go to a country they never lived in before. To make that transition as easy as possible, after candidates accept an offer, they receive a “g’day-and-get-to-know-you” package. While most of the package is personalized for the person – generally, a relocation guide and the contact information of a relocation ambassador is included – everyone gets a “pre-cation” voucher. The pre-cation voucher was essentially time off before the new hire would start their job, so they could explore their new surroundings before they started. Not only did new hires love this added perk, there was a benefit to the company as well, Staunton said. “We know when they do take time to relax and re-charge, they are a lot more likely to hit the ground running on their first day,” she said. Bigger picture, the pre-cation was just Atlassian’s way of ensuring a great onboarding experience. And that “extra mile,” as Staunton put it, had a lasting impact on every new person who came in. Atlassian’s approach was the classic case of how data and creativity can partner to make a winning recruiting campaign. 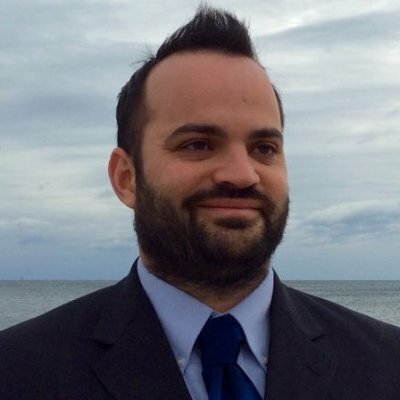 Data was used to determine where to recruit and what the messaging in the recruiting should say; whereas the creative part kicked in as far as what the recruiting collateral should look like and the clever idea of the VW bus. Regardless of if a company is looking to recruit internationally or in whatever area its headquarters are in, Atlassian’s approach is worth copying. It outlines exactly how to use data in a smart way to both target and hone your messaging, while still allowing your creative team the freedom to dream big.